In 2018, the flat fee for a taxi from CDG to Paris was €50 (Right Bank) or €55 (Left Bank). Tipping is optional but customary; a few euros should do the trick. Allow 45 minutes to an hour for the trip. Signs in the terminal will guide you to the nearest taxi stand, where you'll need to wait in line for a cab. 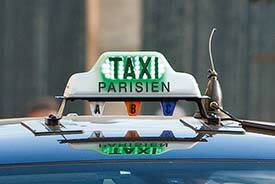 For more information on using les taxis parisiens, including links to cab telephone numbers and an online fare calculator, see our Paris Taxis article. Shuttle companies offer door-to-door service between Charles de Gaulle Airport and city addresses. Travel is in shared vans or minibuses, so the trip may take longer than going by taxi, although you'll avoid standing in line. Parishuttle charges €16 to €25 per adult passenger, depending on how many people are traveling together. Paris Airport Shuttle charges €17 to €40, with a €3 surcharge in the early morning or late evening. Both companies can supply private transfers at a higher cost. A reader tells us that PariShuttle (see above) insists on collecting passengers four hours before flight departure and will not modify its pickup time.